Driving away from the bright lights and big city of Las Vegas yesterday morning and through the desert, 45 minutes to the small town of Indian Springs, felt a lot like coming home after being gone for far too long. Some things were exactly as I remembered them: The casino where we’d have late night meals after church services, the gas station where we’d spend way too much money on soda, chips, and Chester Fried Chicken, the high school, and the park. And then there was the church. This tiny little military building stands as a literal oasis in this dessert town. It is a place where people have found hope, restoration, and acceptance for decades. It is in this place that I, and at least a hundred other young adults over the years, began to get our “feet wet” in ministry. Several nights every year were spent in this tiny church ministering to the children, youth, and adults of this tiny town. Our days were spent doing school assemblies in the high school gym, and outreaches in the park. We would roll into town with our team and vans and trailers filled with props and costumes and sound equipment and for the rest of the week we would be used to impact the town for God and then pack up and roll out until the following year. Now I was returning after five years away. Yes. Many things were just as I had left them. But many things had definitely changed. Over all, the people had changed. The children were taller, the youth were now married and having families, and the adults… many of their faces were now inscribed with the beautiful lines that told of their many joys and sorrows. My first encounter with Echoes of Faith in Indian Springs, NV was in the summer of 2000. I was at the Christ for the Nations Institute youth camp, Youth for the Nations, along with two other team mates, recruiting for the discipleship program I helped lead. I was ministering in an afternoon session when I noticed the face of a young man sitting in the front row. There was something about the smile on his face and the joy in his eyes that kept drawing me back to him. I know now that it was God shining through him that kept bringing me to stop and speak right in front of him; almost directly to him. Through that young man I met Pastor Kimmie Guerino, a woman who would challenge me for the rest of my life to be who God created me to be, to serve exactly where God has placed me, and to love people fiercely without the guarantee of a transformed life. The message of love recorded in I Corinthians chapter 13 is etched in her DNA, pumps through her veins, and saturates the lives of every person she spends time with. Pastor Kimmie grew up in Indian Springs, and in a sense has never left. Through the years she has poured herself out on the people of the town. She has given of her time, money, and energy so that the people she loves would know the love of Jesus. And many times she has waited, like the father in Luke chapter 15. He waited for the return of his son and when he saw him still a ways off, he ran to meet him. I have seen Pastor Kimmie welcome the wayward sons and daughters of Indian Springs with honor and dignity and freedom from all judgment. She has prayed for, cried with, and personally trained the youth of her town. And when many pastors would have tried with all of their might to keep these young people in order to build up their churches, Pastor Kimmie, using her own personal resources, sent them off to the very ends of the earth in order to build God’s church. 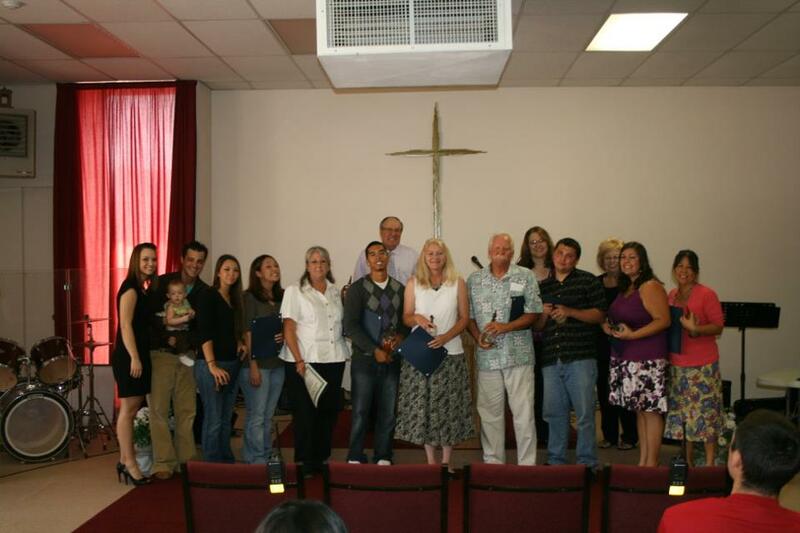 Today I want to honor Pastor Kimmie and I want to honor Echoes of Faith in Indian Springs, NV. I also want to honor Jesus’ Bride, His Body, the Church; which is comprised of many tiny churches. These are churches of which without them the Body could not function. I Corinthians 12: 12 tells us that the body is a unit, though it is made up of many parts; and though all its parts are many, they form one body. We will probably never see Pastor Kimmie televised live preaching to a sports stadium filled with hundreds of thousands of people. But, we also may never see Joel Osteen, Bishop TD Jakes, or Francis Chan knocking on the doors of the homes in Indian Springs delivering Christmas gifts to their families or bringing the elderly to a community meal. These highly influential men of God cannot boast of the same hundreds of young people Pastor Kimmie has personally discipled since they were babies and sent out for the sake of the Kingdom. They also cannot boast of the many who have married and are raising families. They bought homes just outside of town. Yet, they make the 45 minute drive every week, often twice or three times a week out of hope that they might impact the town the same way Pastor Kimmie has impacted them. I wonder if the little churches looked at the mega churches and thought, “we might be better off to dissolve ourselves and join them.” Maybe their feelings of inferiority caused Paul to teach that if the foot should say, “Because I am not a hand, I do not belong to the body,” it would not for that reason cease to be part of the body. And if the ear should say, “Because I am not an eye, I do not belong to the body,” it would not for that reason cease to be part of the body. I am beginning to learn, as I step into every type of church imaginable across this nation that if the whole body were an eye, where would the sense of hearing be? If the whole body were an ear, where would the sense of smell be? But in fact God has arranged the parts in the Body, every one of them, just as He wanted them to be. He placed Pastor Matthew Barnnett in the inner city of Los Angeles to reach the addicts and prostitutes and gang members. He placed Pastor Bill Johnson in Redding, CA to be an agent for His miracles to flow through. And He placed Pastor Kimmie Guerino in Indian Springs, NV to reach the people who might be missed as others drive through the desert giving little or no attention to its inhabitants. 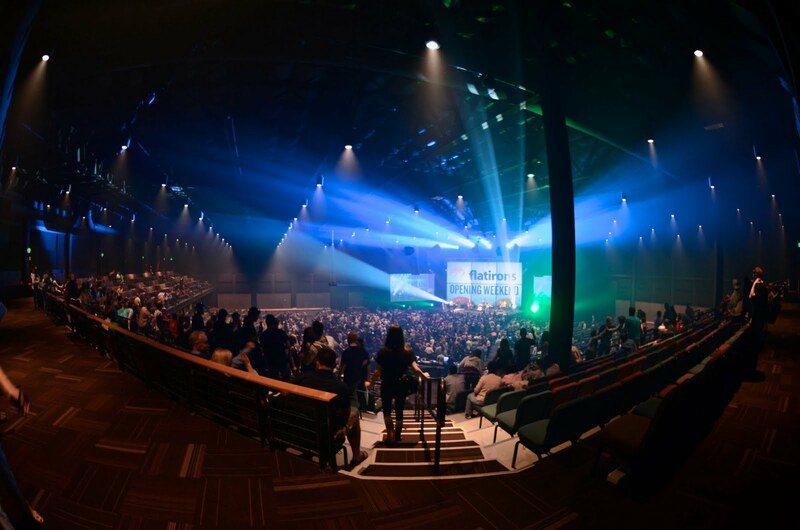 This weekend I walked into Echoes of Faith in Indian Springs, NV, looked around at the less than 50 people sitting in the seats and realized that all of these years I was honored to be speaking in one of our nation’s only, true mega churches. Pastor Kimmie Guerino along with members of Echoes of Faith Church. *Note: Every year Pastor Kimmie , through Echoes of Faith Church, provides Christmas gifts to the families living in Indian Springs, and takes about 20 to 30 the Youth For the Nations camp in Dallas, TX at the cost of $400.00 per individual. She also provides a monthly meal for the elderly of the community. If you would like to give to Echoes of Faith to help with the costs of these projects please contact me and I will get you in contact with pastor Kimmie. Hi friends! The following is a story I’ve written for children. I began this series several years ago and would love to share it with you monthly for feedback. All of the stories will come out of Proverbs as a way to teach children lessons on wisdom. My hope is to one day find an illustrator and have this series published. Please read it to your children or children you know. I’d love their feedback and yours. Character backgrounds: Once upon a time there lived two sisters, but this story is not about the sisters. It is about their trusted Buddies – Ellie & Bobo. 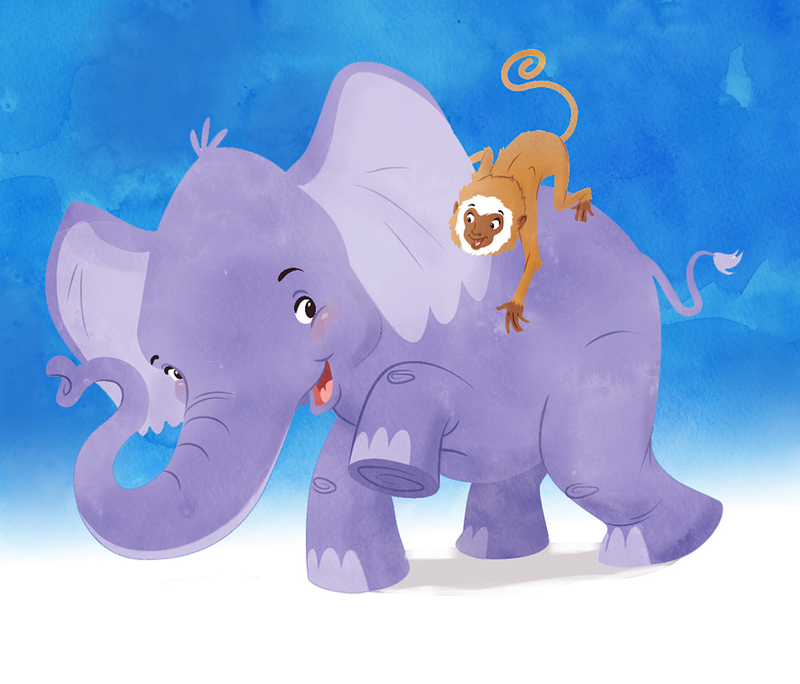 Ellie is a soft-spoken, dainty, stuffed Elephant, and Bobo is her best friend. He is very loving, very strong, and somewhat dopey. He is a rather large, stuffed monkey. Every time Ellie & Bobo are out of sight from the sisters a miracle happens! One morning Ellie & Bobo woke up late. This hardly ever happened. Bobo rubbed his eyes as the bright sun shined in from the large bedroom window. “What time is it, El?” he asked Ellie. Ellie sat on the edge of the bed with her mouth wide open in surprise, staring at a small pink and yellow clock. “It’s already 10:30!” she said in horror. “Where are the girls?” Bobo asked. We are going to visit Gramma and Grampa today. We’ll be back tonight. “Time for an adventure!” Ellie shouted as she danced around the room. They hopped off the bed and tiptoed out of the bedroom. After double-checking that no one was home, they skipped down the hallway into the playroom. There were slides to slide down, cars to drive, books to read, pictures to draw, and mats to tumble on. Ellie & Bobo played to their hearts content without realizing how quickly time had passed until their tummies growled with hunger. “Huh? Did you hear that?” Bobo asked Ellie. “It’s your tummy, silly. You’ve played so hard you’ve worked up an appetite and so have I,” she said. “Let’s eat!” they said as they locked arms and bounded down the hall toward the kitchen. And then they came to one particular cupboard. They opened it up and their mouths watered. This cupboard contained all of their favorite foods: candies, cookies, chips, and chocolates! They ate their way to the back of the cupboard until they realized there was no back to this cupboard! This cupboard led to a very special place where everything was made of sweets and could be eaten! Their eyes widened in surprise when they realized that the grass they were walking on was made of marshmallow and the trunks of the trees were fudge. Every flower was a different colored gumdrop, and the stream that ran along side them was grape soda! Very slowly Bobo picked a flower and popped it in his mouth. Ellie watched him to see what would happen. And just as slowly as he ate that flower, a huge smile appeared upon his face. “Ellie, you’ve got to eat a flower,” he said handing her a bright purple flower. Ellie & Bobo ran and skipped and danced through this special place eating everything in sight. And suddenly it happened. Just as Ellie reached for a licorice tree branch, Bobo reached for the same one. Ellie yanked, and Bobo yanked harder. Bobo gave Ellie a mean look and Ellie gave Bobo one right back. The fight was on! They tumbled and rolled all around, neither one of them letting go of this one tree branch. All of a sudden they heard a loud “rrrrrrrrrrrrrrrrip!” And Ellie started to cry. Bobo got a sick feeling in his tummy and they heard another “rrrrrrrrrrrrrrip!” This time the sound was much louder. “Mine are too!” shouted Bobo. “What’s happening to us?” asked Bobo. They sat on the marshmallow grass in this not-so-special-anymore place with upset tummies and didn’t say a word to one another for a while. “I did the same thing and I ate so much I made myself sick,” Bobo said. “What should we do now?” he asked. “I think the best thing we can do is learn our lesson. We were being selfish and selfish people cause trouble, Bobo. I don’t want to cause trouble for people, especially not for you. You’re my best friend” Ellie said. “I know what you mean, Bobo. But we are lucky that God will help us remember others, if we ask Him to.” Ellie replied. And right there in the middle of chocolate, gumdrops, and marshmallow Ellie & Bobo got down on their knees and prayed. “And my tummy doesn’t hurt anymore,” Bobo said. They held hands and danced around in a circle before heading back to the cupboard. Selfish people cause trouble, but you will live a full life if you trust the LORD. Proverbs 28:25.